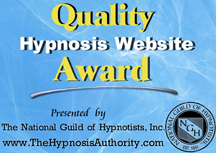 Lynn Swearingen is a member in good standing with the National Guild of Hypnotists and diligently follows the NGH Code of Ethics and Standards of Practice. See for yourself ... read our YELP reviews. "My life's passion is to help people find peace and healing in their lives. Let me give you the tools to be truly happy and live to your full potential." Specialties include healing emotional trauma, stress; boosting confidence/self-esteem, relationship building and healing broken hearts. Live the life you deserve - stop smoking, hypnosis for weight loss, improve memory, recall and concentration, become a masterful test-taker. What do you want to improve in your life? You can Love Your Life Again. If you can dream it, you can do it, with a little help from Bay Area Hypnotherapy. WHY WAIT? This is your life – it isn't a dress rehearsal. Step off the merry-go-round of repetitious, self-destructive behavior. There is always that one thing in your life you feel powerless to change. Breaking habits and initiating change is never easy when you try it alone. Quite often we unwittingly program our own subconscious mind to actually work in opposition to what we truly need, want and desire in our lives. But your subconscious always wants to help you. It’s just that you’ve been sending it faulty information and mixed messages. then this is your call to action — Set your life on a new course TODAY. We are all in the process of becoming who we already are. Hypnotherapy will help you to access the power of your mind to enable positive, lasting, behavioral change and live the life you’ve only dared to dream of. You have resources, tools and capacities within you; gifts that have always been there, hiding in plain sight, just waiting for you to tap into them. Bay Area Hypnotherapy™ has devoted itself to providing a healing, nurturing environment where you can find a peaceful refuge from the outside world and achieve your goals in a safe place with someone who cares.